Back in July of 1947, newspapers initially reported that a crashed flying saucer had been recovered near Roswell, New Mexico. While the explanations regarding what really happened back then have changed over the years, one thing that hasn’t changed is that this city of 48,000-plus remains a mecca for UFO enthusiasts and believers to this day. And while today’s Roswell citizens and visitors probably won’t find smoking gun evidence of actual “little green men,” they can look up and see proof of a giant one! The 21-foot-tall alien stands in the parking lot of a brand-new Dunkin’-Baskin Robbins in Roswell. 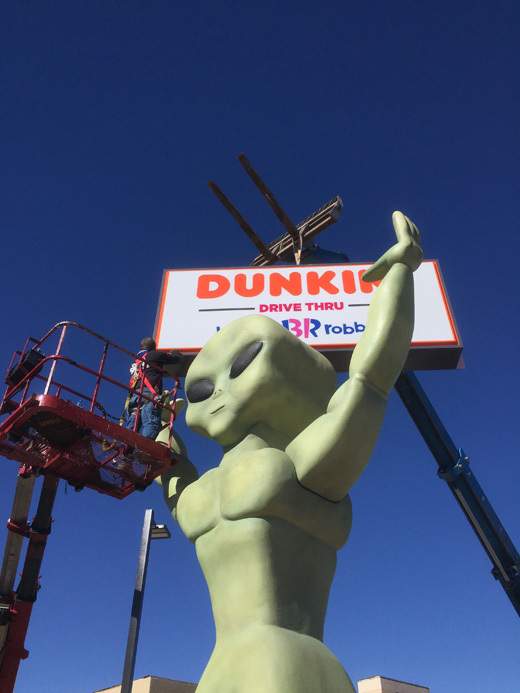 This oversized green alien stands in the parking lot of a brand-new Dunkin’-Baskin Robbins restaurant that opened up on North Main Street in Roswell this past December. 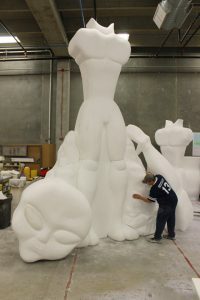 The alien, made of foam with interior steel poles and plates in strategic places, measures twenty-and-a-half feet tall. 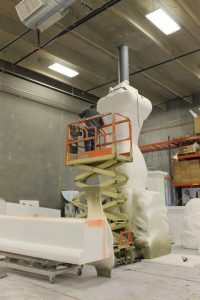 Add in faux-stonework and the internally illuminated LED store sign cabinet it holds in its hands, and the entire display arrives at a total of twenty-six feet tall. 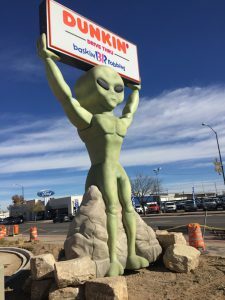 This structure is the brainchild of Murad Fazal, one of the managing partners of Fazal Development Network, LLC (a franchisee of Dunkin’-Baskin Robbins in Chicago and throughout New Mexico). Fazal wanted some type of landmark equipped with longevity that would attract attention and photo opportunities at their soon-to-open Roswell location. Sign Encounters of the First Kind: Take Us to Your Designer! 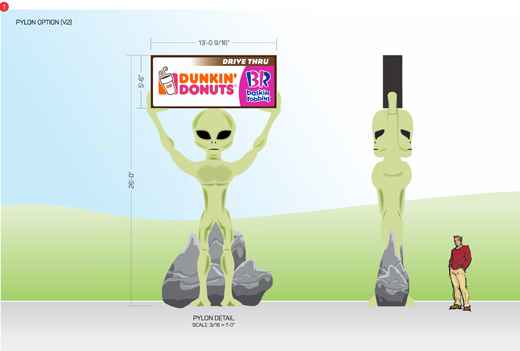 Taking the area’s “intergalactic” history into account, Fazal contacted national sign company Persona, Inc., back in November of 2017, asking them to incorporate an “alien” theme into a pylon sign for this new location. As an approved signage vendor for Dunkin’ Brands, Persona had worked with Fazal’s firm over the years on various projects throughout New Mexico. With corporate headquarters in Watertown, South Dakota, as well as four other centralized manufacturing locations, Persona has grown leaps and bounds since its founding back in 1980 into one of the largest signage and lighting companies in the U.S. The alien sign was drawn up from scratch. Design: Persona Inc. This entire alien piece was drawn up from scratch. 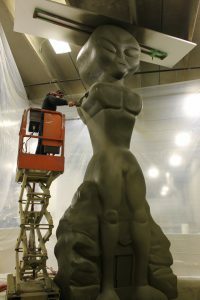 Fazal sent Persona several reference photos he’d come across, while Persona’s sales team and graphics department collaborated to research alien descriptions and existing landmarks so that the pylon sculpture would maintain the general theme surrounding Roswell. “We wanted to design a one-of-a-kind creature, while maintaining a common figure that restaurant customers would relate to,” says Peterson. Taking inspiration from those concepts, the Persona graphics department used computer software to shape and define the alien, as well as detail the lines and contours of the surrounding space rock. The end-result is that Fazal chose to incorporate the alien as a pylon pole cover appearing to hold a Dunkin’-Baskin Robbins sign above its head. Shaping the sign out of foam. There are a lot of (inter)stellar ingredients that make up the DNA of this alien—an internal steel pipe and tube structure; aluminum extrusions, aluminum angle, a polycarbonate face, and LED electrical components for the sign cabinet; and foam. It was this last substrate that led Persona to “make contact” with wholesale foam-core provider Signs By Benchmark, also of Watertown. 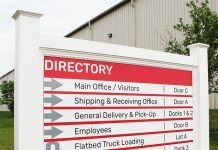 “They wanted to see if it was even feasible to build something like this and what changes would be needed to make everything work,” says Jamie Kakacek, senior designer at Signs By Benchmark. 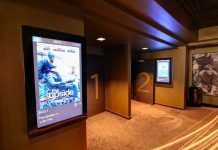 Persona has partnered with Signs by Benchmark on several previous projects. “Being that both of our companies are located in Watertown, it allows a unique opportunity to work together to deliver the custom products that our clients look for,” says Peterson. Signs By Benchmark started assembly at the bottom and worked their way up, piece by piece. Persona assembled the steel internal support structure and provided it to Benchmark so that they could build the alien around it. This support structure was incorporated into the alien’s torso. Horizontal support sleeves for the steel tubes were imbedded within the arms. While a two- or three-pound density of EPS foam could’ve been used here, Kakacek explains that utilizing a lighter density allowed them to sculpt the parts a little quicker. “And since we were going to be spraying our polyurea coating over the entire structure, we didn’t have to worry so much about getting all our durability from the EPS,” he says. Construction was pretty labor intensive on this project. 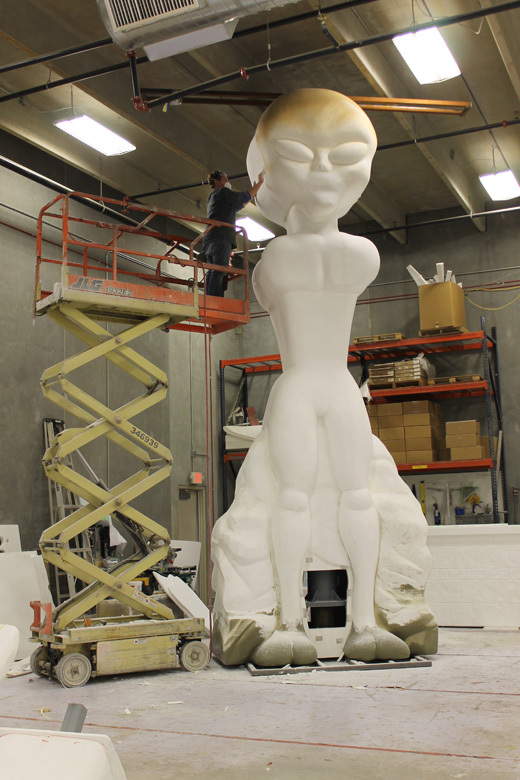 After assembly, Signs By Benchmark worked on the final shaping of the alien. “We had to pay close attention to each joint where we married pieces together and make sure we didn’t have any noticeable seam running all the way up the side,” says Kakacek. The entire alien body was coated with PPG Envirobase paints. The design intent of the surrounding stonework called for it to be a little grittier and more realistic than the alien, so stucco was used here. Meanwhile the entire alien body was coated out of PPG Envirobase paints. “We wanted something that was going to withstand the harsh sun of New Mexico while still being friendly to work with,” says Kakacek. The foam alien was shipped via a flatbed truck to the Roswell install site in five sections: the head, the torso, the feet, the arms, and the stone base. Clover Signs handled the installation of this 2,500-pound alien creation. Persona contracted Clover Signs of Brazil, Indiana earlier that summer to oversee the later installation of this 2,500-pound alien creation. “Clover Signs has been a valued partner and subcontractor of ours for over fifteen years,” says Peterson. Clover Signs Owner Andrew Allender started out by installing hotel/motel and high-rise signs for Persona before moving his focus to unique specialty signs for them all over the country. However this was going to be his first alien. To ensure a smooth installation, Persona supplied Allender with blueprints and progression photos of the alien as it was being built. Clover Signs used an Elliott boom/crane truck and a telehandler to lift the alien. Allender was in frequent contact with Persona and Signs By Benchmark to help them understand, design- and fabrication-wise, what he needed for secure mounting later on. It was decided each stage of the support structure would be plate-mounted to the next. “We had to have plenty of access to get to the plate on the bottom. Everything had to be square and straight,” says Allender, adding that, once the alien was built with the foam around it, then nothing further could be done. 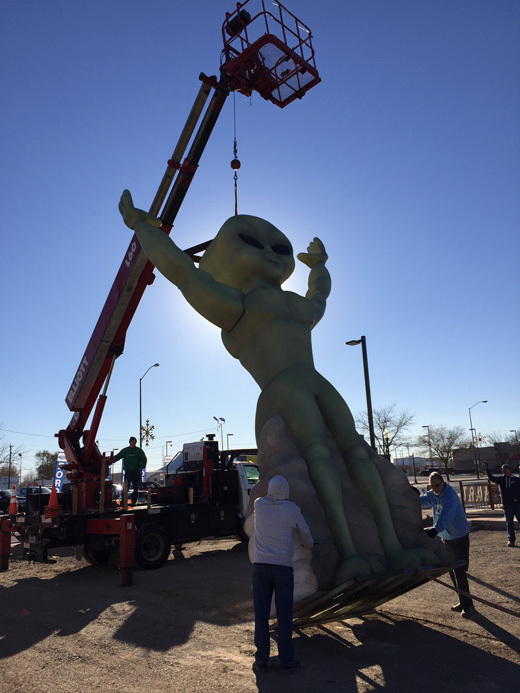 A month before the install, Allender trekked down to the Roswell site to set the pole into the ground that would support the alien structure. “I cut this pole first to make sure the feet would fit to it. This way, the alien could stand there when I put everything together atop it,” he says. Regarding the actual installation process, the area was first cleared to dig and pour the concrete foundation per engineering requirements. The arms were bolted to the torso, as the steel support structure was already installed inside of it. Signs By Benchmark supplied shipping legs based on Allender’s request for aid in helping the alien pieces stand up as they were lifted off the ground. 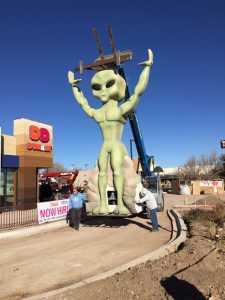 Allender and his three-person install crew used an Elliott boom truck with a 6,000-pound crane on it and a telehandler to pick up the bolted-together alien and set it into place over the pre-existing pole without swinging or getting out of control in the small parking lot area. The steel pole pylon structure is concealed entirely within the foam alien. 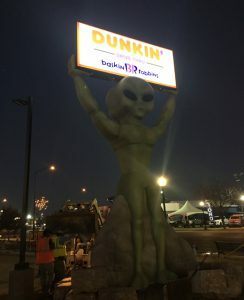 To the naked eye, this makes the finished piece appear as if the alien figure is holding the LED-illuminated Dunkin’-Baskin Robbins sign cabinet above its head. 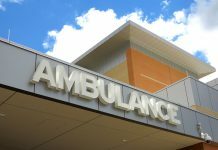 Because of this, Persona provided Signs By Benchmark with a plate connection and three-inch steel angles to add during construction. The plate connector is hidden atop the alien’s head, and the steel angles were added to the palm of each hand. Allender’s crew lifted the sign cabinet up and attached it to these connecting spots. Lifting the illuminated sign cabinet and bolting it to the alien’s hands. Primary electrical supply for the sign was provided to the base of the display through the concrete foundation. The power supplies are located inside the sign cabinet itself. Secondary wires were then routed to the Dunkin’-Baskin Robbins sign cabinet within the steel structural support through the mounting plate connection. The install took eleven hours to perform and was completed prior to the store opening the next day. “One of the things I thought was beneficial was that we cut the pole on-site instead of ahead of time because you never know what the grade and terrain are going to be,” says Allender. Sign Encounters of the Fourth Kind: First Contact with the Public! Response to the new alien pole cover provided by the intelligent life behind this project has been out of this world! 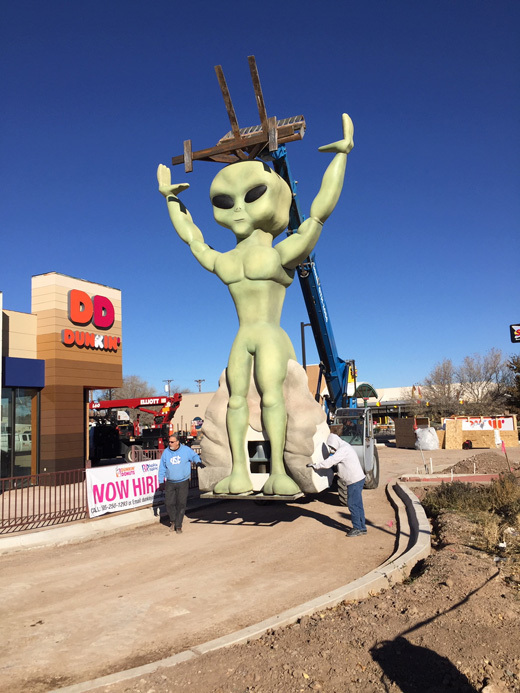 Fazal and his company, as well as Dunkin-Baskin Robbins customers and passerby onlookers, have all raved about the newest extra-special, extraterrestrial addition to the Roswell landscape. A documentary crew even filmed its setup. “We are excited to have been able to contribute to something that will become a local landmark for the area,” says Peterson. “Unique local attractions appeal to tourists and residents alike. Reaction the new sign has been out of this world! Kakacek gives credit to his staff at Signs By Benchmark (in particular, Larry Seefeldt, who oversaw the project from start to finish) and the special skillsets they possess. “Without everyone here, you’d just be staring at a very large block of foam,” he says. “This has definitely been a highlight of my time here at Signs By Benchmark and something I hope we can continue to build on. Next articleOcé Arizona 1300 Series: Do more. Do it smarter. Do it now.